Hello, boaters! Come and enjoy the San Diego Sunroad Marina Boat Show on January 24-27, 2019 at Point Loma Peninsula Sunroad Resort Marina San Diego. Lots of fun for real boaters! If you are a boater, don’t miss this once a year event! We’ll have the brands and companies you’ve come to know and love, as well as new marine services and products, free boating seminars, boat rides, libations and more. 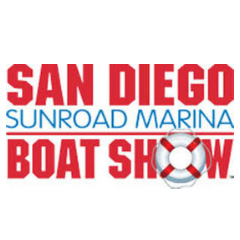 San Diego Sunroad Boat Show will feature new & pre-cruised sailboats and motor yachts at our in-water display, dozens of marine vendors with the latest nautical products & services. In addition to the tremendous boats, there will also be a plethora of marine vendors and electronics with the latest nautical products and services, boating seminars, as well as food and beverages for attendees to enjoy a day on San Diego Bay. Call 877.965.7368 to book your reservation today! Click here to send us your Reservation Request! “Great service, clean and everything worked as advertised. Would recommend”. We have rented from other companies and this was BY FAR the best experience. The 28′ Weekend Warrior was so spacious, in perfect working condition and was clean!! Both Ryan and Johnny were super helpful and polite. I will always rent from Camp n Style when I have the need for a trailer. I just wanted to let you know we had an AMAZING time at the dunes. The trailer was perfect and Ryan was amazing as well. We plan to use you in the future!!!! FOR SURE! THANKS!!!! “Thanks for another great weekend delivery is always prompt and easy. Trailer always clean and staff always friendly and helpful. We’ll be back next season”! I wanted to take a moment to let you know what a wonderful team you have. Both Jr. and Johnny are extremely helpful and great customer service. We stayed January 26th to 29th. We had no issues with our trailer! Johnny was very thorough and went through everything. He was very friendly and made sure all our questions were answered. We had a friend show up and had rented a fifth wheel through “company X” when it arrived it was HORRIBLE and was going to fall over as soon as someone walked in. One of the front legs would not come down so they stacked 2×4’s 3 feet high… total disaster waiting to happen. Needless to say they were not going to stay in it. “Brand X” took the fifth wheel away and left our friends stranded with no place to stay. We called Camp n Style and between JR and Johnny they had another trailer out within the hour. Best Customer Service ever!! You have earned 100’s of future customers. We will never rent anywhere else and neither will anyone we know. Thanks for making our Glamis trip so wonderful!! “Thanks again for the trailer last weekend. It was just what we were looking for to make our trip a perfect experience for everyone”.